In this article, we'll cover how you set up the data on Dataclips and configure each of the Heroku Postgres Dataclip widgets on Geckoboard. It's is a secret URL that holds the results of a SQL query on a particular Heroku Postgres database. By sharing a Dataclip URL the same way you would share the underlying data, any recipient can view that data within, download it as a CSV, or even embed it live into a tool like Google Sheets. 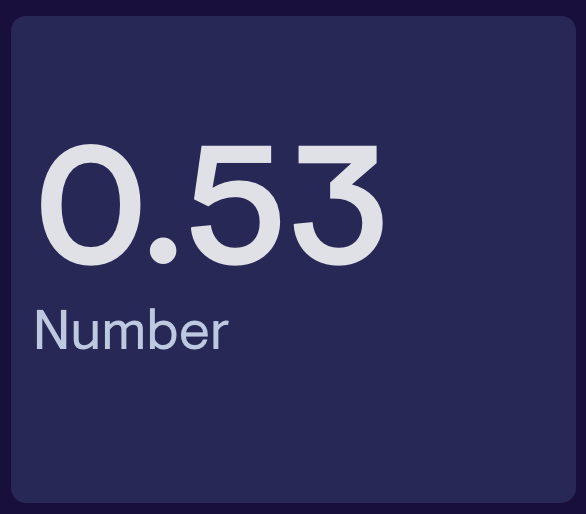 The number widget allows you to display numeric data in a widget from a Heroku Dataclip URL. The widget expects numeric data for the column specified in the configuration under field. The URL to your Heroku Dataclip, provided in the browser address field or from the share option. Versions are ignored, and just the current Dataclip is used. You can choose which of the options returned from the Dataclip you want to display in the number widget. The drop-down menu shows the attributes returned in the SELECT statement, in this example book_purchases and month, so we'll choose book_purchases. If the drop-down menu is empty, then your data is not being returned in the expected format. See the SQL example below for data that is returned in the correct way. Choose to display the first or last entry from the column indicated by field. e.g. in this example, the data is displayed in ascending order with the most recent month being last, so we choose last entry. The x-axis field will take alpha-numeric data but the y-axis expects just numeric data. You can choose which of the options returned from the Dataclip you want to display in the widget along the x-axis. The drop-down menu shows the attributes returned in the SELECT statement, in this example book_purchases and month, so we'll choose month. If the drop-down menu is empty, then your data is not being returned in the expected format. See the SQL example above for data that is returned in the correct way. 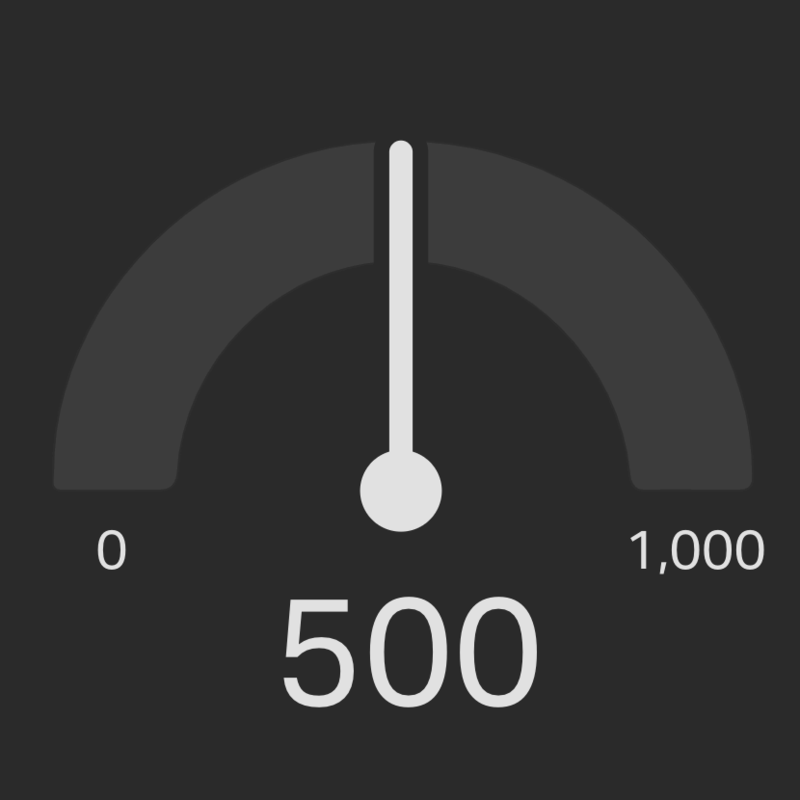 You can choose which of the options returned from the Dataclip you want to display in the widget along the y-axis. The drop-down menu shows the attributes returned in the SELECT statement, in this example book_purchases and month, so we'll choose book_purchases. The current item field expects just numeric data from the column selected in field. Minimum and maximum values are automatically calculated based on all items in this column. You can choose which of the options returned from the Dataclip you want to display in the widget. The drop-down menu shows the attributes returned in the SELECT statement, in this example book_purchases and month, so we'll choose book_purchases. Specifies which data value in the field chosen to treat as the current item, the main white number in the picture above. The x-axis takes alpha-numeric data, and the y-axis takes just numeric data. 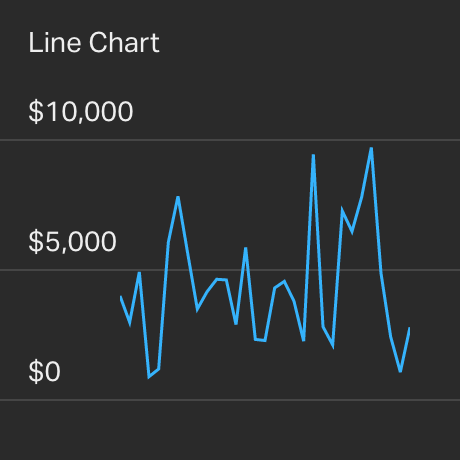 Date/time values used in the x-axis are automatically detected and are automatically formatted for you in the line chart. Non-date/time data can also be used but isn't re-formatted in any way. 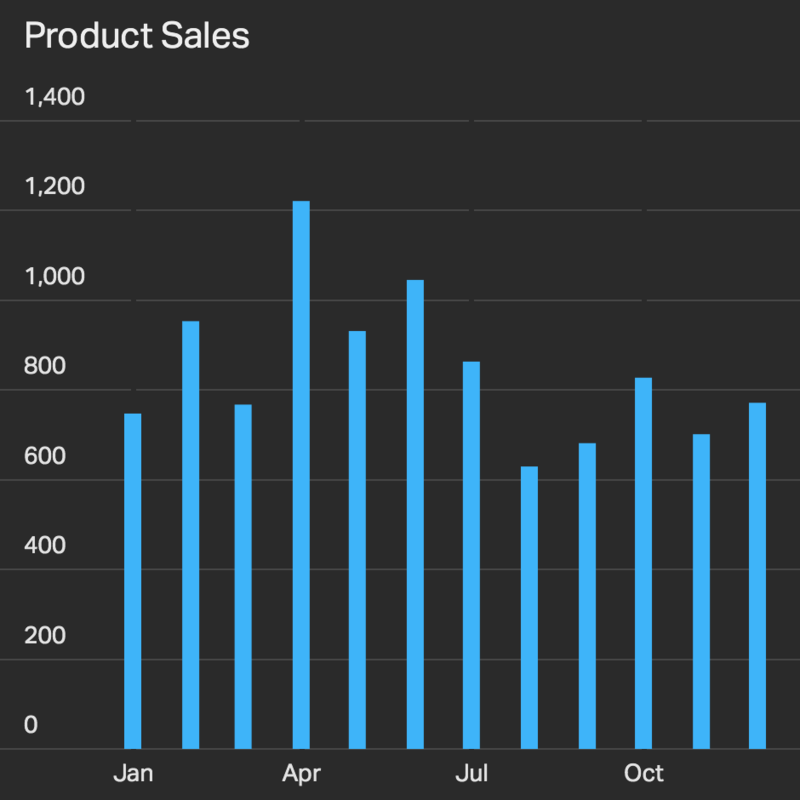 The x-axis takes alpha-numeric data, and the y-axis takes just numeric data..
You can choose which of the options returned from the Dataclip you want to display in the widget along the x-axis. The drop-down menu shows the attributes returned in the SELECT statement, in this example state and total_sales, so we'll choose state. If the drop-down menu is empty, then your data is not being returned in the expected format. See the SQL example below for data that is returned in the correct way. You can choose which of the options returned from the Dataclip you want to display in the widget along the y-axis. The drop-down menu shows the attributes returned in the SELECT statement, in this example state and total_sales, so we'll choose total_sales. The widget expects numeric data for the column specified in the config under field. It displays up to 3 values, with null values being included in that count but not being shown. You can choose which of the options returned from the Dataclip you want to display in the widget. The drop-down menu shows the attributes returned in the SELECT statement, in this example gender and total_sales, so we'll choose total_sales. Choose to display the first or last 3 entries from the column indicated by field. e.g. in this example, only three values are returned, so we'll choose first 3 entries. Optional label shown against the first state, indicated in red in the above picture. Optional label shown against the first state, indicated in amber in the above picture. Optional label shown against the first state, indicated in green in the above picture. Show the colors in the reverse order, so GAR (Green, Amber, Red). 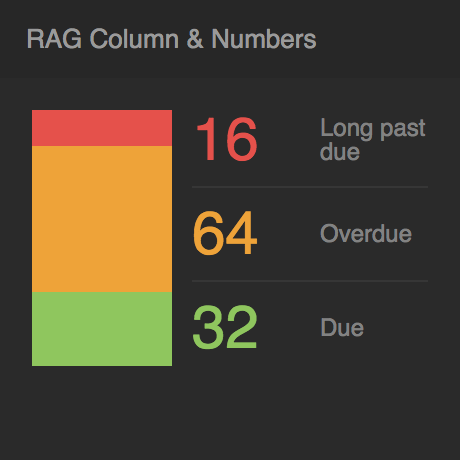 The widget expects numeric data for the column specified in the config under field. It displays up to 8 values, with null values being included in that count but not being shown. Choose to display the first or last 8 entries from the column indicated by 'field'. e.g. in this example, only three values are returned so we'll choose first 8 entries. Optional label shown against the first funnel. Unknown in our example. Optional label shown against the fourth funnel. Optional label shown against the fifth funnel. Optional label shown against the sixth funnel. Optional label shown against the seventh funnel. Optional label shown against the eighth funnel. Show the colors in the reverse order, so larger numbers are red instead of green, and smaller ones are green instead of red. 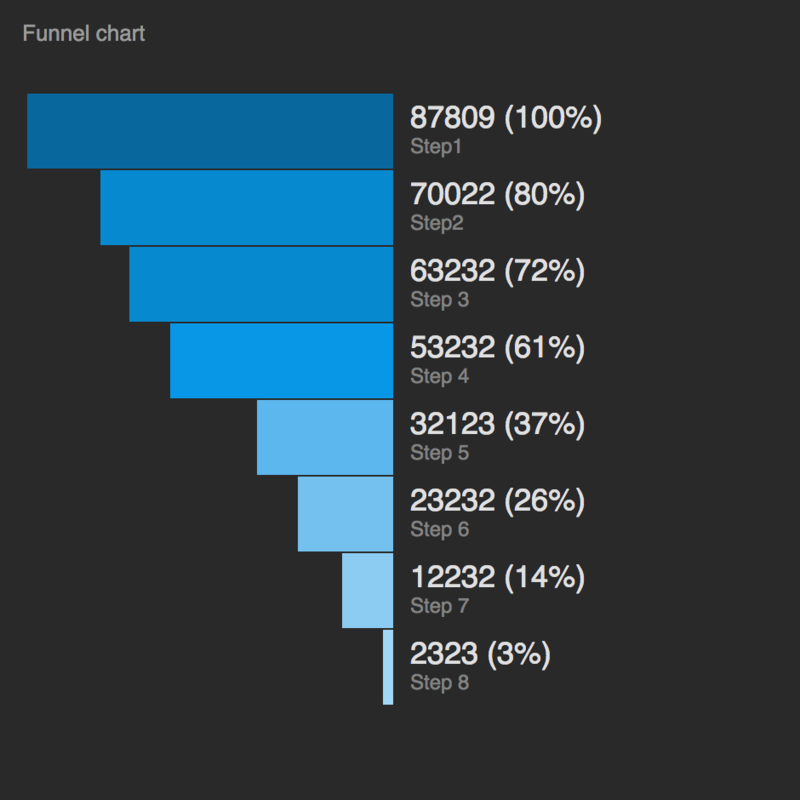 Percentages are shown as conversions between stages in the funnel. In our example we aren't displaying data as stages so we'd set the Hide percentages to Yes.